Associate professor of cultural geography at the University of Exeter. She is currently a fellow at the Centre for Advanced Study in Olso, Norway. The strategy released in early January (two weeks before Donald Trump's inauguration) takes Jarvis’s guidance to heart, and suggests that while reasonable efforts will be made to protect resources and mitigate the effects of climate change, when this isn’t feasible managers may choose to document threatened features and prepare for their loss. Not everything can be saved, the strategy suggests, and sometimes it may be necessary to allow ‘environmental or other forces… to destroy or remove all or portions of the resource.’ In his 2014 memo, Jarvis justified this position by saying that ‘History will judge us for the choices we make, and we will take comfort in knowing that sometimes the hard choices are also the ones that are best for our resources, our parks, and our Nation.’ It’s not clear how this new approach is going to play out in practice. The strategy stresses that ‘decisions for loss must be made with appropriate consultation and compliance’—but there are as yet no clear guidelines for how to reconcile anticipated loss with the presumption of protection embedded in historic preservation legislation. Deciding which resources to let go is not an easy process, however, and so far Gateway’s ruins zoning has been applied mostly to structures that are already in very poor condition. In this sense, the new ruins classification just formalises a policy of benign neglect that had been unofficial and unstated, by recommending that some of Gateway’s derelict gun batteries and military remnants be allowed to continue to decay. But the banding will be reviewed as conditions change, and as sea levels continue to rise future designation will likely take in other, more significant, structures. 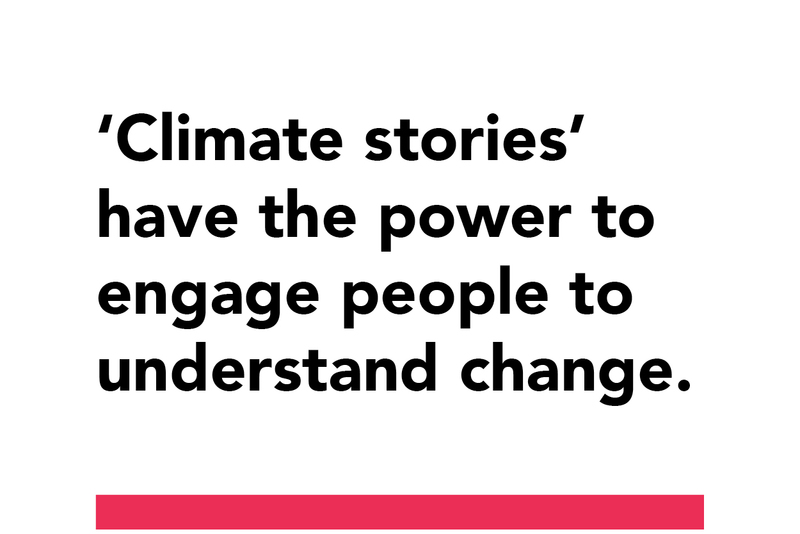 One of the key messages in the new NPS cultural resources climate change strategy is about acknowledging the power of ‘climate stories’ to engage people in understanding change. When a decision has been made to recognise loss, interpretation of that change becomes critically important. In 2009—years before Sandy’s wakeup call—Gateway managers were already thinking about how they might stage an experiment in loss and storytelling at Battery Weed, a 19th-century fort guarding The Narrows at the entrance to New York Harbour. A report flagged up that the fortification was likely to face increasing inundation due to sea-level rise, and moving the structure to higher ground would be prohibitively expensive and logistically complicated. ‘Given the Battery’s sturdy construction,’ the report concluded, ‘it is also possible to leave it as is, and dedicate it as a monument to measure and teach sea level rise.’ Future visitors could view the fort from above, as the water rose within it, reflecting on a story of defence (from invading navies and sea water) and, eventually, graceful surrender. ‘Climate change is one of the great challenges of the 21st century,’ wrote Jarvis in his 2014 memo. ‘It is remaking our world and substantially influencing how we set priorities and make management decisions. The process of adaptation will not return us to the way things have been done before, but it will assist us in making choices in the face of uncertainty and change’. It is difficult to envisage a moment more racked by uncertainty and change than the current one, caught as we are in the political storm that began on January 20 and shows no sign of abating. It is probably safe to say that implementation of the new cultural resources climate change strategy is not high on the agenda for the new Republican administration. Jarvis retired as NPS director a few days before the strategy was published, and when President Trump gets around to appointing his successor he may well decide to punish the agency for its outspoken climate change advocacy and his lingering resentment over the inauguration crowd numbers squabble. A new NPS director may decide to shelve the strategy altogether, but deciding not to recognise loss doesn’t mean that the loss won’t happen anyway—unrecognised and unplanned. The NPS has a deferred maintenance backlog of over $12 billion, the federal hiring freeze will hit already depleted staffing levels, and the prospect of promised tax cuts makes commitment of additional resources unlikely. The reality of pinched resources, compounded by Trump’s planned gutting of the regulatory framework, could create hundreds of new ruins zones for the wrong reasons, with loss happening not by intention but by attrition. For now, as the nation is held hostage to the ‘art of the deal’, it’s worth pausing to recognise the brave and hopeful move that the NPS has taken towards learning the art of losing—as a process of attentive and informed adaptation. 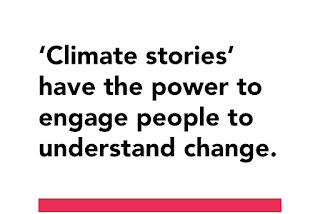 As the strategy points out, ‘Climate change is the heritage of the future,’ and pretending it’s not happening misses an opportunity to tell a story that may help us face that future and learn to live with the changes it will bring. Caitlin DeSilvey is author of Curated Decay: Heritage beyond Saving; coauthor of Visible Mending; and coeditor of Anticipatory History. She is associate professor of cultural geography at the University of Exeter. She is currently a fellow at the Centre for Advanced Study in Olso, Norway. 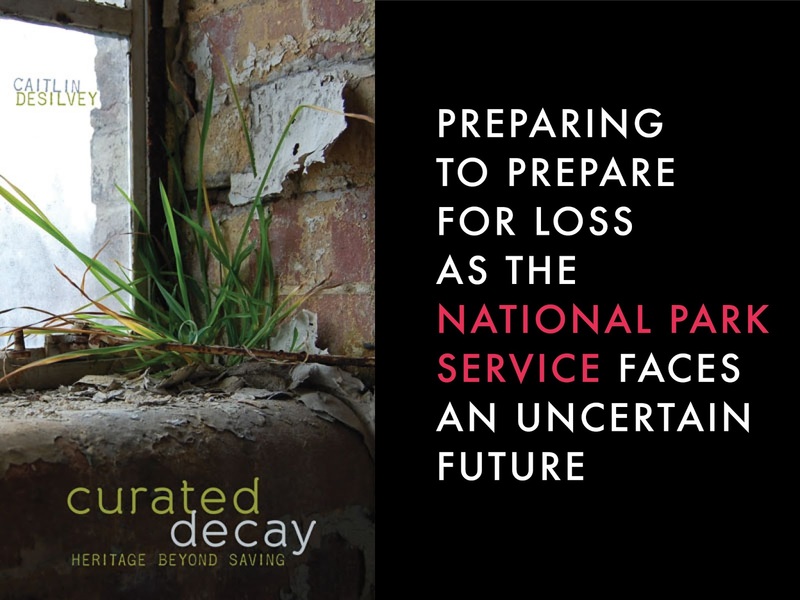 "Curated Decay offers a sophisticated and novel account of sites that challenge the current paradigm of conservation. It also proposes a wealth of concepts by which the curation of such sites may be rethought in terms of ecological culture. The writing is fresh, direct and exciting and carries the reader along effortlessly." 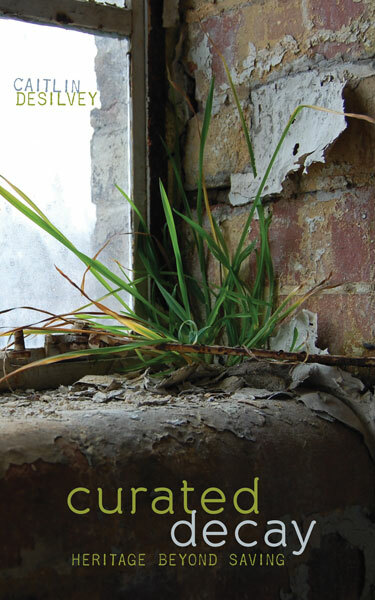 "Curated Decay is wondrously marvelous—a brilliant and beautiful exploration of how we can and might engage with the ultimately evanescent companions (landscapes, buildings, objects) that accompany our own evanescent lives. 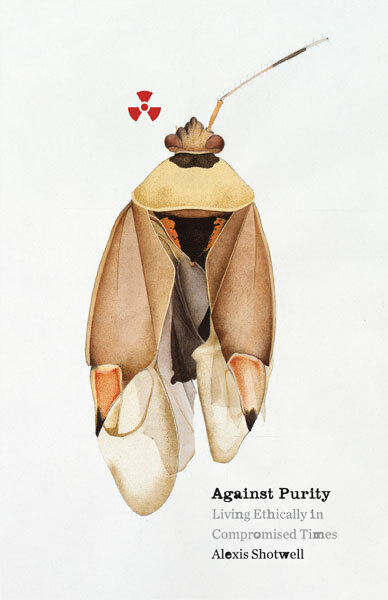 Caitlin DeSilvey sets her deeply thoughtful meditations on our ambivalent interactions with the transient things we cherish in evocative discourses about a dozen hauntingly depicted diverse threatened and beleaguered locales, from Montana to Cornwall to Scotland and the Ruhr. These illustrative stories are couched in a narrative of personal travel and discovery that is a continual joy to read, fresh, witty, and jargon-free." 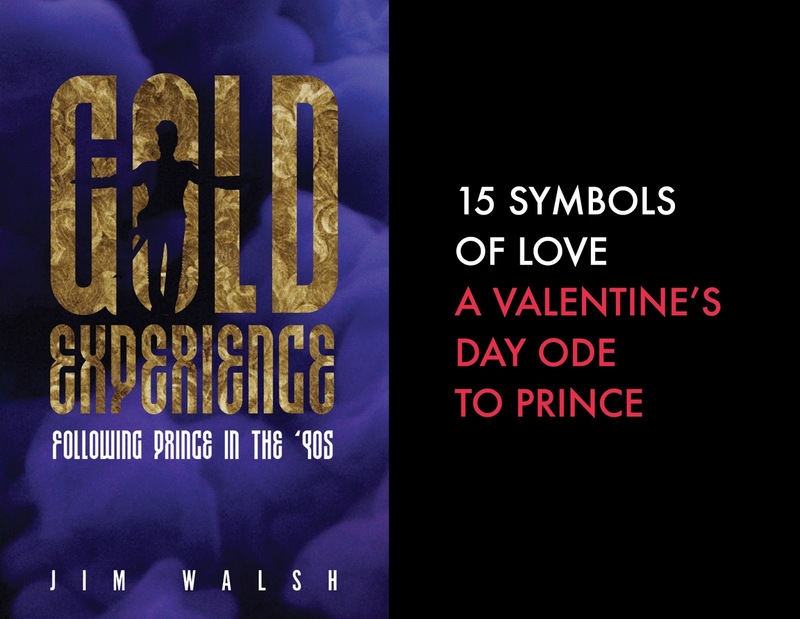 An instant classic that the ever-prolific Prince gave to Sinead O'Connor, whose no-holds-barred vocal took it to another stratosphere. That rarest of songs, which can make lovers pine for each other - even when they're right next to each other. Unlike the clumsier “Head” or “Sister” of the same era, this is vintage Prince at his raunchy best. A make-out song for the ages. 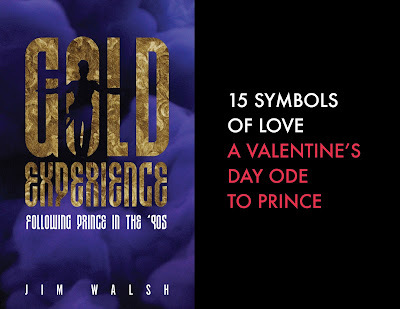 An echo-drenched, drum machine-swathed testimonial of endless love worthy of Romeo or Juliet. There's strength in a politics of imperfection. On the Facebook event page for the protest, someone posted: “So where was this when Obama signed a ban in 2011 against Iraqi's and again in 2015 when he put a ban on Muslims?? Hypocrisy at its finest! !” Later he clarified that he didn’t actually care about the travel ban (he thought it was a good move for the US to protect its borders and not let anyone in). He was just pointing out the hypocrisy of protesting Trump’s policies without having had an equally explosive and massive resistance to Obama’s policies. Recognizing our involvement in and complicity with things we think are wrong, fully understanding the weight of wrongdoing in the history we inherit, or understanding the harms that have come from our failure to act can feel quite awful. The right uses purity politics against the left because we're the ones who respond to being implicated in doing harm. They’re correct that we are involved in the very things that we want to stop, but they’re wrong to think that being compromised means we should stop protesting. If we stop working against them, terrible things simply continue. 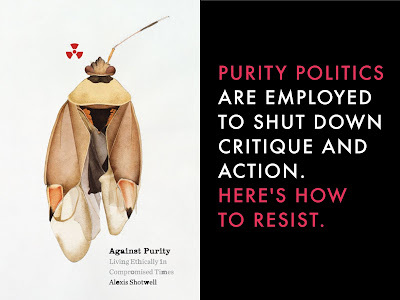 If we are to be effective, we who want to have a world in which many beings and ecosystems can flourish, we should reject purity for purely tactical reasons—it demobilizes us. 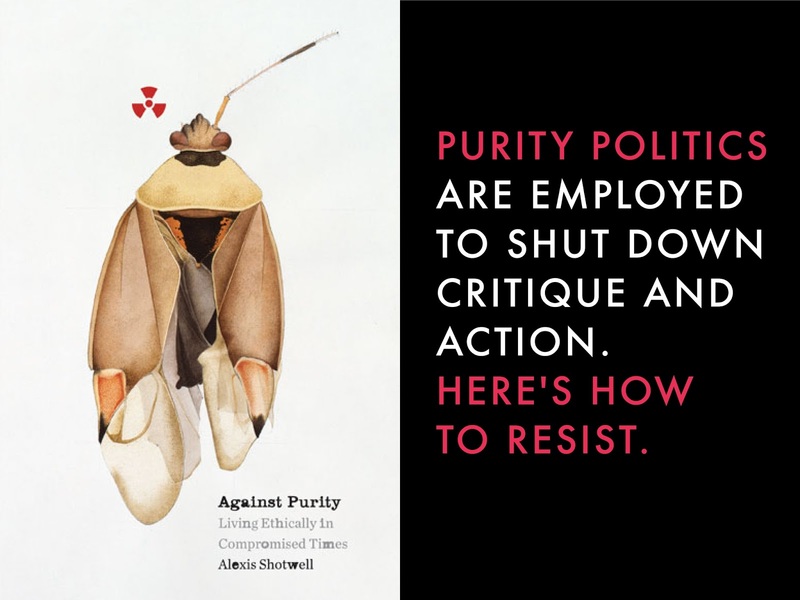 Alexis Shotwell is author of Against Purity: Living Ethically in Compromised Times and Knowing Otherwise: Race, Gender, and Implicit Understanding. She is associate professor in the Department of Sociology and Anthropology and the Department of Philosophy at Carleton University. In latest Sherlock Holmes in Minnesota installment, the typically flawless Holmes is plagued by doubt and illness. In his four novels and 56 short stories featuring Sherlock Holmes, Sir Arthur Conan Doyle always depicted the great detective in the prime of life. The Holmes in these tales is not only a perfect thinking machine but also athletic, fearless, and supremely confident. Yet what might have happened to Holmes as he grew older? Conan Doyle doesn’t really address this question in any detailed way. About all that is known from his work is that Holmes retired at some point to Sussex to keep bees and perhaps write an occasional monograph on some esoteric topic related to criminal investigation. But it’s fascinating to think of Holmes as a senior citizen, coping with the challenges of old age. It was this idea that led me in part to writing Sherlock Holmes and the Eisendorf Enigma, which is set in 1920, when Holmes would have been in his mid-sixties. Other writers, of course, have also explored the topic of Holmes during his advanced years. One of the most notable efforts in this regard is the 2015 film Mr. Holmes, with a screenplay by Jeffrey Hatcher (who adapted my novel Sherlock Holmes and the Ice Palace Murders into a fine play). In the film, Holmes is 93 and dealing with memory loss as he tries to solve one last case. The Holmes featured in Eisendorf Enigma isn’t yet suffering from memory problems but he’s clearly not quite the man he had been in his younger years. His mind is still as agile as ever, but age has nonetheless taken its inevitable toll, especially on his body. As I was planning the novel, I tried to imagine what sort of infirmity might befall Holmes as he aged. One illness—emphysema—came readily to mind. Smoking is a prominent cause of the disease, and as Conan Doyle’s tales demonstrate, Holmes was an addictive personality for whom tobacco was both a supreme pleasure and a dangerous vice that held him firmly in its grip. Although Holmes is most commonly associated with a pipe, he also smoked cigarettes and cigars. He was very selective in this respect and even had his cigarettes specially made in London. Holmes also enjoyed good cigars (Cubans in particular) and he rarely went anywhere without a pouch of black shag tobacco for his pipe. Such was his devotion to the demon weed that he even wrote a monograph in which he claimed he could identify 140 different types of tobacco based solely on the ash they left behind. By the time he reached his sixties, Holmes had probably been a heavy smoker for at least 40 years, so it did not seem a stretch to think his lung function might have become compromised. So it is that in the opening scenes of the Eisendorf Enigma, Holmes travels to the Mayo Clinic in Rochester (where in my earlier novel, Strongwood, Dr. John Watson underwent gallbladder surgery). At the clinic Holmes is diagnosed with moderate emphysema, a condition that leaves him short of breath, especially during any kind of exertion. The disease is a trial for him, as is the daunting possibility that he will have to give up his beloved tobacco for good. While in Rochester Holmes, who has traveled to Minnesota by himself (Watson must stay in London to attend to his medical practice), suddenly finds himself facing an old nemesis known as the Monster of Munich. The Monster, who had committed a series of grisly murders in Munich in the 1890s, is now ensconced in the village of Eisendorf, a tiny community tucked into a steep little valley not far from Rochester. I created Eisendorf (population 40 and dropping) as a place profoundly isolated and full of hidden dangers. Its seclusion reflects Holmes’s own circumstances during his years of retirement. Based (very, very loosely) on New Ulm, Minnesota, the town owes its existence to a band of German freethinkers who arrived in the 1850s with the dream of creating a small utopia devoted to reason and enlightenment. But Eisendorf is anything but a paradise on earth. Instead, it is a dying, haunted place that harbors terrible secrets. Once he makes his way to Eisendorf in hopes of unmasking the Monster, Holmes must confront not only a vicious killer but also his own doubts. In the process readers will see a more vulnerable Holmes than they are used to, not the “high-functioning sociopath,” as he describes himself in the BBC series featuring Benedict Cumberbatch, but a man dealing with his own troubling emotions. Uncertainty, loneliness, and even hints of existential desolation assail Holmes in the Eisendorf Enigma, and yet as he moves toward his ultimate showdown with the Monster he finds two women who help revitalize his long sterile heart. Watson, too, finally arrives on the scene, hurrying to Eisendorf after Holmes is injured, and together they are finally able to hunt down the monstrous killer who has made the town his home. I hope readers will enjoy my novel—the seventh time I’ve had the privilege of bringing the world’s great consulting detective to Minnesota. 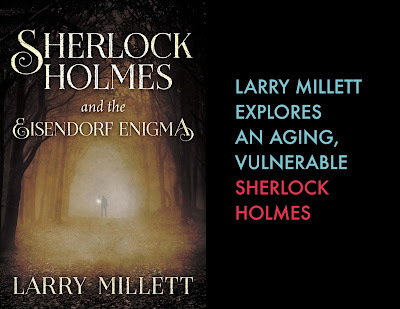 Larry Millett is the author of twenty books, including Sherlock Holmes and the Eisendorf Enigma and seven other mystery novels—most set in Minnesota—featuring Sherlock Holmes and St. Paul detective Shadwell Rafferty. A longtime reporter and architecture critic for the St. Paul Pioneer Press, Millett is also the author of numerous books on architecture. "I always look forward to a Larry Millett book. I’ve read every one of them." 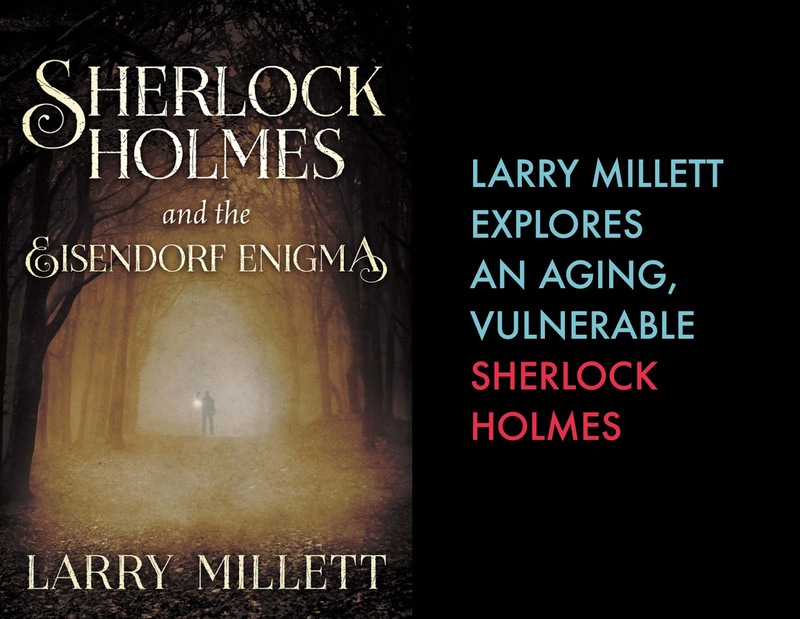 "Larry Millett breathes new life into the classic character of Sherlock Holmes in this intriguing, home-grown mystery. 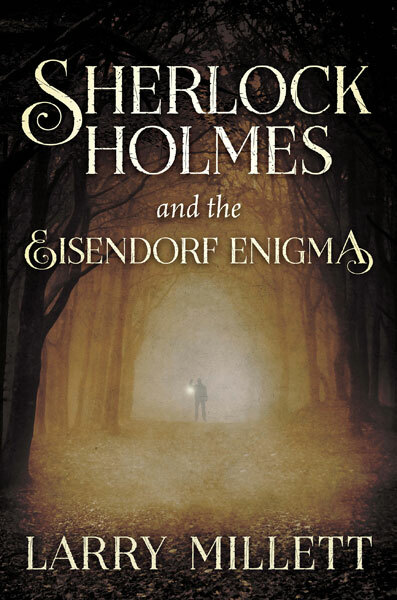 Sherlock Holmes and the Eisendorf Enigma is both elegant and entertaining." "Millett’s descriptions are lush and rich, and anyone who likes to craft a good visual in their head will appreciate his attention to detail with the setting. Minnesota is a beautiful place, and the author’s descriptions create a written picture that will match any photos you pull up on the Internet or in a book."